The new Vauxhall Astra Sports Tourer has been uncovered at the Frankfurt Motor Show. Like the five-door hatch, the Sports Tourer is lighter and more efficient than the car it replaces and is powered by a new range of petrol and diesel engines ranging from 100PS to 200PS. 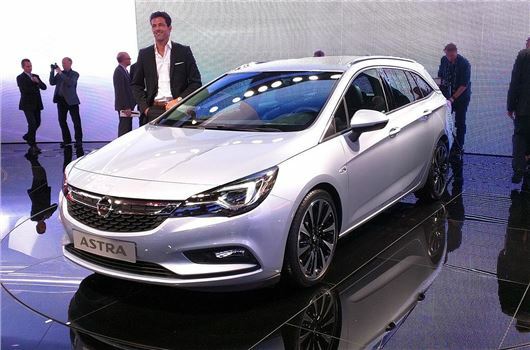 The new Astra Sports Tourer is 200kg lighter than its predecessor and gets a more upmarket design, with splashes of chrome across the large front grille and sweptback headlights. The car is actually the same dimensions as the outgoing model, but looks longer due to its sloping roofline. Vauxhall say they have reworked the interior to provide more space, with the driver getting 26mm additional headroom, while passengers in the rear have 28mm more. Maximum storage is a whopping 1630 litres and the tailgate can be specified with keyless entry, which operates with a simple small kicking motion under the rear bumper to open the tailgate. In order to increase loading space the Sports Tourer comes with 40/20/40 foldable rear seats enabling even more flexible loading space configurations. Under the bonnet the Astra is offered with petrol and diesel units ranging from 100PS to 200PS, which includes the 1.6-litre Whisper Diesel that will return lower CO2 emissions and better economy, with the most frugal variants of the new Astra officially capable of up to 91.1mpg and 82g/km, at least in the EcoFlex, economy focused arrangement. Standard equipment has been improved too, with even basic models getting touchscreen infotainment, phone connectivity and air con. Going for a top-spec car gets you heated front and rear seats and active safety technology including collision mitigating brakes. Navigation is standard on all Tech Line models, or on Elite Nav and SRi Nav. Specifying navigation adds a larger touch screen system.